One of the questions people often ask me is “Where to start scripting?”. The answer isn’t simple, it really depends on so many factors like, what should the script do, how should it interact with the user, what features do I put in, will I make it easy to maintain and update, is it necessary to be updatable, etc… So, you see, starting writing a script isn’t always easy and it can even discourage some beginners from diving more into this part of CG that is very helpful but not seen as much “creative” commonly, which is a bit of a misunderstanding the concept, but still, the result is that people often rather invest several hours in manual labour than a few minutes writing a simple loop doing some simple tasks for them. Anyways, here’s my tip for starters. I got it from, I believe Paul Neale, when I was starting out as a scripter. It really does help and essentially is super simple, further more, this little tip keeps your script tidy, neat, professional looking and easy to track. So, what is it you ask? Take a look at the screen grab of MXS Pro Editor. This is basically it. Before writing any code down, put a header in your script file. I usually put in a short description of what the script does, version log and a copyright with a web address or e-mail for bug reports etc. How does this help you getting started? Believe it or not, it does help tremendously. When I was starting out, my knowledge of MXS was very limited, my scripting semantics and customs were close to none and I always got stuck when I opened a new script file to start writing some code. Then I read this helpful tip from an experienced pro and suddenly, it really helped me getting started. It certainly won’t help you gain superior knowledge above Bobo’s MXS skills, not at all, but it does help you to start writing something. You start out with these few lines and all of a sudden, you have a tiny little script file ready to get filled out with useful MXS commands in front of you. It’s all a matter of your psyche. You get the feeling you’ve started already so you sort of get rid of the puzzling and overwhelming feeling of “how do I start”. And that’s all to it. Give it a try and you’ll see you won’t get stuck when trying to write your first scripts. Once you get used to this routine, you won’t have any trouble at all starting even the most complex of scripts. thanks for the document! but the thing is how to get the MaxScript Editor? Can you send the download page to my E_mail box? 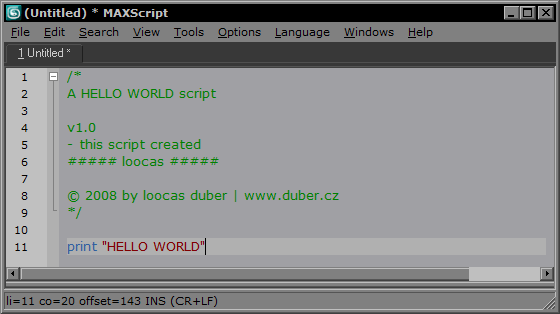 Could you please tell me how to get the MaxScript Pro Editor! The MAXScript Pro Editor is a standard component of 3ds Max 2008 and above. If you’re using an older version of Max, you’re out of luck.